There will be a limited number of rest stops along the route. Rest stops provide water, light snacks, and restrooms. If you have any special dietary needs or need more than a light snack, feel free to bring your own food to the event. Volunteer Ride Marshals will be available to guide you along the route and help out if you get a flat or need a quick bike adjustment. 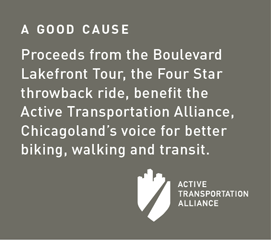 Proper preparation for Boulevard Lakefront Tour will go a long way toward your full enjoyment of Chicago’s best neighborhood bicycle ride. Before the ride, do a safety check to make sure your bike is in good working order, or take it to your local bike shop and have them look it over.